In early 2013, the Queensland state government embarked on an extensive state-wide consultation process to help develop the Queensland Plan, a 30-year strategic plan for the state that was to set out goals and foundations relating to health, education, prosperity and infrastructure, amongst others. The aim of the Plan was to have a broad approach rather than producing specific policies. The consultation process took place over 18 months and involved a series of different events tailored to different audiences, including industry workshops, online surveys and large-scale summits. The Queensland Plan was the brainchild of the Liberal National Party government. The Liberal National Party (LNP) of Queensland was formed in 2008 by a merger of the state branches of the Liberal and National Parties. This is not the same as the current federal Australia government which is a coalition of the Liberal and National Parties. Prior to the LNP taking office in 2012, the Labor government released their vision for Queensland, Towards Q2, in 2008. This laid out a variety of targets relating to the environment, education and so on. The Labor plan apparently relied more on experts to inform its content, but also involved extensive public consultation (Brisbane Times 2014). Queensland has seen a limited number of participatory processes in comparison to some other Australian states. Nonetheless, it has been home to a couple of citizens' juries and a large scale summit to deliberate on managing population growth in Queensland. The latter was also a state government initiative. The Queensland Plan consultation was initiated by the state government. It is not clear from the information available if other organisations were involved in the planning and design of the consultation program. The summits were facilitated by Twyfords, a community engagement consultancy. Colmar Brunton, a market research firm, provided analysis on the initial part of the consultation, in between the two summits. The Queensland government state that 80,000 people "contributed to the process (as in people and in groups)" (Qld.gov.au 2016). The infographic above shows the participant numbers and events. The single largest events were two summits held in Mackay and Brisbane in 2013 with 424 and 626 participants respectively. "The Mackay Summit was attended by delegates from every Queensland electorate, Members of Parliament, Mayors and a youth delegation. The summit had bipartisan support, and featured representation across diverse backgrounds covering community groups, sporting organisations, business, Indigenous, youth, multicultural and disability sectors" (Queensland Govt 2013). It is not clear from government publications how participants were selected or recruited to attend the summits. Brian Feeney notes that MPs selected community delegates to attend the Mackay summit, rather than a random or stratified sample. As a result, older age groups were "significantly over-represented and females under-represented" (Feeney 2014). "For the Brisbane summit, community delegates were in the minority, with MPs, prominent Queenslanders, directors-general and senior public servants, and representatives from local government, sectional interest groups (so-called peak bodies), youth, and education delegates being the majority [note 26]. The demographic profile of this majority is very unlikely to reflect that of the state population as a whole [note 27]. Consequently, it cannot be claimed that the outcomes of summit discussions represent the aspirations of the Queensland community as a whole"
Consultation for the Queensland Plan took place over 18 months and involved a range of activities for different groups including stakeholders, young people and community representatives. In April 2013 a workshop of 140 industry representatives to "recommend consultation themes to guide discussion about Queensland’s future" (Qld.gov.au 2016a). The aim of this workshop was to focus discussion for the forthcoming consultation and develop key themes to be explored in the development of the plan. Participants worked in groups according to each theme, with four tables per theme. Their task was to consider what sort of questions related to each theme would encourage people to have meaningful conversations about them. Mackay is coastal city in Queensland, nearly 1000km north of the state capital Brisbane. On 10th May 2013, over 400 Queenslanders attended a one-day summit in Mackay to develop questions for the Queensland Plan. The six questions developed during the day were used guide the development of the Plan. During the day, attendees first worked in electorate group to define issues facing their local areas. 101 questions were generated from this activity. Attendees were then put into randomly assigned groups to workshop questions relating to the key themes which had been developed in the industry workshop. During this time, the working groups refined discussions to produce five questions per theme. These questions were then posted on sticky walls around the room. In addition there was also room for wildcard questions - those that didn't fit into a theme but were nonetheless important. The final output of the Mackay Summit was six questions that were then used to guide development of the Plan. A primary schools competition encouraged students to draw their vision for Queensland in 30 year's time on a postcard, with the chance to win an iPad. A similar method was used in the Pilbara Dialogue in WA a decade before. The childrens' visions included better environmental protection and better health services (The Bulletin 2013). 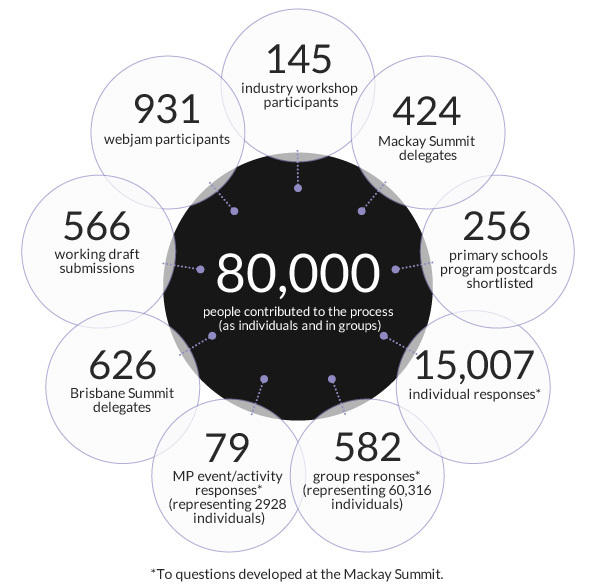 Between May and August 2013, a community survey developed by Colmar Brunton was available online and on paper for Queenslanders to answer the six questions developed at the Mackay Summit. "In addition to these six questions the survey included demographics, an open ‘catch-all’ question and a set of questions to obtain both participants desire for future participation and their contact details. A further set of prompted questions were included (from 19th July onwards), that provided participants with a list of responses Queenslanders had provided to each of the six questions, in an aim to make participating in this consultation process more accessible for all Queenslanders" (Colmar Brunton 2013, p31). In addition to individuals who filled in the survey, feedback on the questions was gathered through MPs who through local groups or events, gathered feedback from their constituents and summarised it for the consultation. Responses were categorised as either individual or group responses. Groups included businesses, government agencies, community organisations and clubs and societies. The aim of the survey was to capture feedback from every corner of the state, but the majority of responses were from South East Queensland - the most populous and prosperous part of the state. However, this skew could simply be a reflection of the fact that the population density is much higher in this region. Furthermore, demographic information was not collected in all cases. The most under-represented group was young people born after 1997 (Colmar Brunton 2013, p46). The Brisbane Summit took place over two days in October 2013. The aim of the meeting was for participants to process and synthesise feedback from community engagement and the consultation so far, and begin to shape the first draft of the Queensland Plan. Feedback summarised by Colmar Brunton was presented to the summit delegates, who asssessed the content and discussed how it aligned with their own interests. The majority of participants at the summit were sectional interests - including politicians, stakeholders and education delegates. A Panel session presented future challenges for Queensland and participants were able to ask questions. After this, delegates worked in themed groups to discuss how success could be achieved. Overnight, the project team for the Queensland Plan synthesised the first day's work into groups. The second day of the summit focused on prioritising outcomes. A group of thirty randomly selected delegates were identified to workshop ideas that came out of the community survey. Ultimately, the summit "confirmed the focus areas and enablers and identified an initial set of goals, outcomes and priorities" (Queensland Govt 2013a, p7). A draft Queensland Plan was released in December 2013. The draft was prepared by the Queensland Government following the Brisbane Summit. It was open for public review until March 2014. A survey designed by Colmar Brunton was deployed during this time to gather feedback. The primary aim of the review was to ensure that the draft reflected earlier feedback from Queenslanders. 566 responses were submitted, with over 50% having previously participated in the consultation in some way. A Webjam is a live text-based forum that enables people to discuss and vote on various issues. Five webjams were held in early 2014 on key themes and participants were able to vote on suggestions based on the community survey feedback. It is not clear if participants were invited or self-selecting for the webjams. The Queensland Plan was released on 30th July 2014. In addition, the plan was also enshrined in legislation in the form of the Queensland Plan Act 2014. This was in response to feedback garned during the consultation process that Queenslanders wanted "long-term approach to state planning beyond the electoral cycle" (Qld.gov.au 2016b). The Plan was reported in a range of state and local media outlets, with mixed responses. Some cast doubt on the feasibility of actually implementing the plan, with opposition Labor MPs suggesting the high-profile Plan forming part of the LNP's campaign for the 2015 election - rather than a long-term, bipartisan plan for the state (Courier Mail 2014). The Sydney Morning Herald considers, on reflection, that the Queensland Plan was one of Campbell Newman's "unsung achievements" (Sydney Morning Herald 2016). "The Queensland Plan, to be funded and to move forward, needed assets to be sold and that was quite clear in the legislation. Queenslanders do not want their assets sold and we are not going to do that even to fund the Queensland Plan" (Brisbane Times 2015). Conversely, another Labor MP argued that although the new government should review the Plan, it would be a mistake to scrap it completely, suggested that the Plan's goals are "mostly uncontroversial" (Courier Mail 2015; Morning Bulletin 2015). At the time of writing (Sept 2016), the Labor government have launched a review into the Queensland Plan (Brisbane Times 2016). Insufficient context for community engagement: the broader public were not made aware of the government's level of committment to various suggestions or provided with any scope. Confusion between Vision and Plan: the Plan was supposed to be a vision for the state. However, visioning involves communities identifying values and goals. Conversely, the six questions directed at the wider community for the Plan were about how to achieve certain goals - suggesting that the goals were already decided by the time the process reached the broader community engagement stage. Inadequate resourcing of the process: time and money restraints meant a) squeezing the large-scale events into short time frames which were inadequate for deliberation and b) relying on MPs to reach the broader community. Summit participants did not reflect a cross-section of the state population: the two face to face summits were not open for anyone to attend, nor did they employ a random selection process. Instead, MPs invited community delegates and other attendees were mainly business and other sectional interests. This risks the outcomes of these summits not being broadly representative of Queenslanders. Engagement processes were tightly controlled by government: discussions at the Mackay summit were limited in time and depth and did encourage in-depth deliberation. MPs took the lead in group discussions, with delegates sitting in electorate groups. This meant that they had the opportunity to lead direction of discussion, and possibly put others off expressing their views. Online survey respondents not representative of Queensland population: survey respondents were self-selecting. Unsuitable survey questions: questions were unclear and there's no indication that they were tested prior to deployment. After a while it was necessary to add prompts to the survey to help people answer the questions. Claims that 78,251 individuals are represented in public submissions have not been justified: questions over how this number was calculated have arisen from the reporting that 582 group responses represented over 60,000 people. Furthermore, almost half of the group responses came from private businesses. It is unclear whether this assumes that a business response represents the views of all its employees.